For those who are worried that technology and the Internet are closing in on us too fast, too soon, the book is a soothing balm. 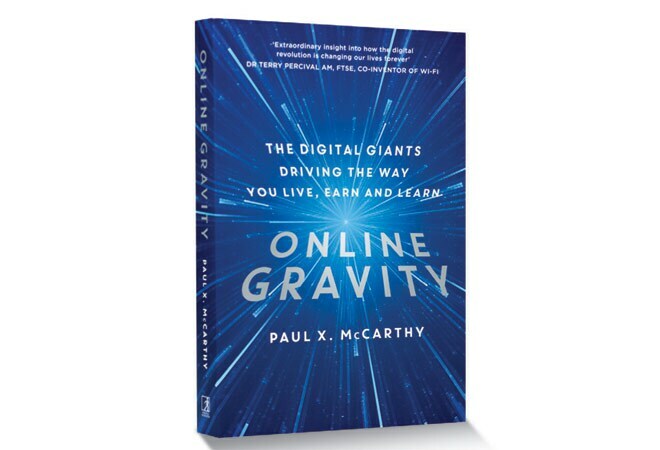 Online business pro and technology expert Paul X. McCarthy's latest book is a fascinating account of how the startling and intriguing phenomenon called 'digital' has brought its own set of rules for business giants and start-ups alike to harness. For all devil's advocates and naysayers feeling vexed and worried that technology and the Internet are closing in on us too fast, too soon, and for those who feel they are on a collision course with the ever-growing global and competitive workforce, Online Gravity is a soothing balm. Although McCarthy reveals the existence of the dominant giants in the business, the book also reveals remarkable opportunities for smaller companies to cash in on the "distinctive and original insights into the new set of rules that are reshaping" how to conduct business, how to work, even our personal lives and leisure. Understandably, online has become the new home for innovation. McCarthy writes about how new businesses are bringing in new ways to get things done for the online community, often "combined with the new-found capabilities of the web to support mobile, real-time and big data interactions". At the heart of the book are ideas and knowledge. As McCarthy says, "good ideas" and "reliable knowledge" are "different from many other commodities in our lives" as "they are not things that any individual and company can own". Add to this our thirst to know more. The web empowers us to not only change the way we work and go about our daily life but also help others with information they can use and learn from. It's not surprising that the quest for knowledge has become all-pervasive, moving beyond traditional barriers. McCarthy explains this by citing the "talent signatures" for knowledge economy giants such as Apple, Google and Amazon and their diversifi cation to alternative approaches in hiring. Consider this: Apple has seven times the number of liberal arts graduates than others in the domain; so does IBM. Delving deeper into the domain of knowledge, McCarthy reveals how small can, indeed, be beautiful - or ugly - for business, too. Taking the nuance of timing into account, small events that in the past may not have been thought relevant, can today have signifi cant "snowball" effects by virtue of online gravity. He cites how new products and companies can innovate and harness the exponential online growth capabilities with the help of powerful platforms such as Google, Facebook, Alibaba and Amazon. Perhaps, the book's prime focus is the set of seven laws shaping the new business world. McCarthy explains their inherent ability to help present and future generations transform into relevant, informed workers and business owners of the century. Just like the online world it explores, the book is a global phenomenon, digital by its very nature, with the ability to exponentially speed up processes, create a network as infi nite as its reach, and act as a harbinger of ubiquitous and multi-dimensional talent. The theories and observations that McCarthy unravels in the book are not just about the digital giants driving the way we live, earn and learn. Just like gravity keeps the stellar bodies in place, in addition to the online superstructures there's still "lots of space in between" for more diverse and smaller structures to create their own identity.